Make your appetizer a meal. 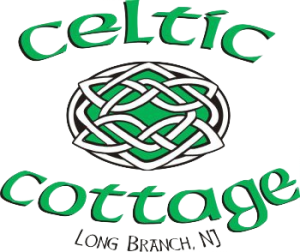 Add a half order Skinny Fries for $2.50 or Cottage Fries/Onion Rings for $3.00. The best way to start off any meal at the Celtic Cottage! Deep-fried mozzarella sticks served with zesty marinara sauce. A perfect combination of cheddar cheese and jalapeno served with cool ranch dressing. Deep-fried breaded large shrimp served with cocktail sauce. SAUCES: Plain, Medium, Hot, Spicy Crab, Teriyaki, Garlic Parmesan, BBQ, or Baby Ray’s Sweet Red Chili Sauce. Grilled chicken over fresh Romaine lettuce tossed with our special Caesar dressing, topped with croutons, and Parmesan cheese. Sandwiches served with Skinny Fries and pickle chips.Choose a Kaiser roll, white or rye bread. Caught ya! Deep-fried breaded cod on a roll with tartar sauce on the side. Tender breast of chicken specially seasoned and grilled over an open flame. A 4-ounce rib-eye charbroiled to perfection. Yum! Burgers served with Skinny Fries and pickle chips.Choose a Kaiser roll, white or rye bread. Eating this burger is almost like kissing the Blarney Stone. You won’t get the gift of gab, but you will get a burger that you won’t be able to stop talking about. It’s a half-pound of beef charbroiled just how you like it. Just like the Blarney Burger, you won’t be able to stop talking about this burger either. It’s served with your choice of cheese: American, Cheddar, Provolone, or Swiss. It’s a blarney cheeseburger plus bacon and your choice of cheese. The Celtic is half-pound of charbroiled beef topped with honey ham, raw onion, and American cheese. Served on white toast. 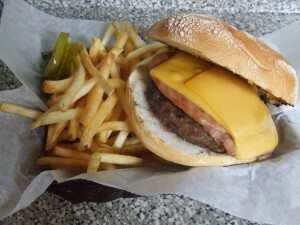 Our half-pound burger grilled to perfection then topped with pork roll and the cheese you choose. American, Cheddar, Provolone or Swiss Cheese; Fried Onions; Hot Peppers; Cheddar Cheese Sauce; Bacon; Lettuce/Tomato/Onion. You’ll think that you’re in the Emerald Isle herself when you have these traditional Irish sausage served with Cottage Fries. You never ‘sausage’ a place! Batter-dipped pub style cod deep-fried and served with our famous Cottage Fries and tarter sauce. A special combination of ground beef in tasty gravy, topped with peas, carrots, and real mashed potatoes. Cooked here at the pub and piled high on rye or a hard roll if you choose. Served with Skinny Fries. Beer-battered and deep-fried, just the way you like them. If you can’t go to Ireland, you might as well go to heaven. You’ll think you’re there eating this lava cake. Our Irish coffee provides all the main essential food groups: alcohol, caffeine, sugar and fat. It’s a perfect ending to any meal!